Scattered content is an everyday problem for many people. Any given file could be sitting on your desktop, attached to an email thread, tied to a database, or stored in any number of different places. We’re taking on this problem by making Dropbox a unified home for your work, with initiatives like our recently announced Google Cloud partnership. Today, we’re introducing the first product integration in this new partnership, an add-on for Gmail that will help you stay focused on what matters. With the Dropbox add-on for Gmail, you’ll be able to view, store, and share any file—from the smallest doc to the largest video—without leaving your inbox. 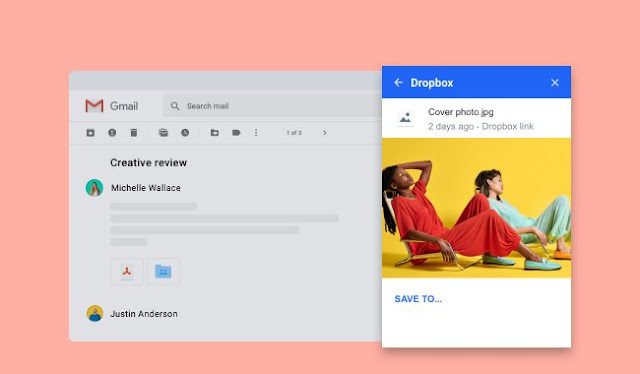 This integration deepens our investment in the G Suite ecosystem, offering a cross-browser, cross-platform addition to our existing Dropbox for Gmail extension for Chrome. This new add-on will work with any browser, as well as the Gmail app for Android and—coming soon—iOS.